There are regions of the world where at a particular time of the year, we can observe some unique wildlife behaviour. There are also unmissable photography opportunities for those in search of unusual images or simply curious travellers. Amongst these remarkable locations, there is a river in the coastal zone of southern Alaska called the Chilkat River. This region is, above everything, part of the Tlingin Indians’ ancestral territories – in their own language they are called the People of the Seas – whose population stretches from what is now British Colombia to the Aleutian Islands, and was there well before the arrival of the white man to these coasts. The name ‘Chilkat’ means ‘salmon reservoir’ and precisely names the local tribe who lived along its banks. The descendents of these people still live in the villages of the area. But this river is also a special location for huge gatherings of Bald Eagles, particularly in the winter months when large birds of prey struggle find enough food. This wide, shallow riverbed has geographical peculiarities which mean that certain areas never freeze, leaving the salmon constantly accessible. The eagles know this, and some of them spend the winter in the trees along the riverbanks. The spectacle of these huge birds of prey monitoring the salmon from the tree branches is unique. 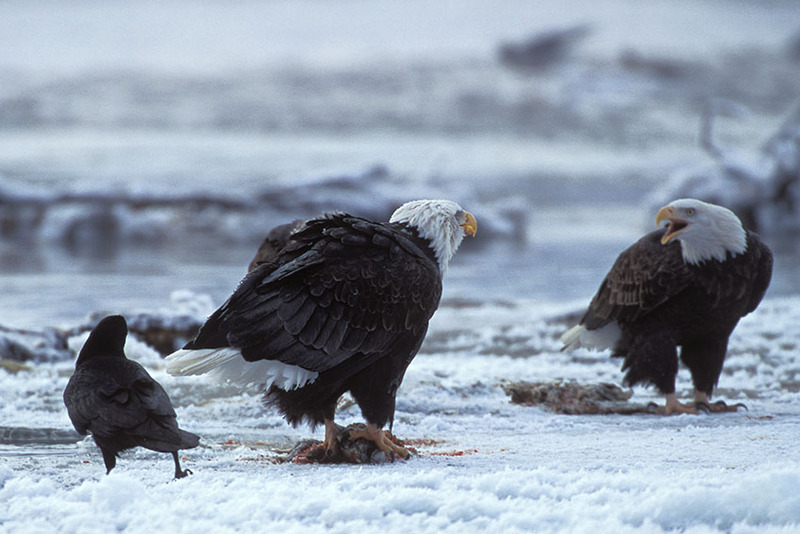 I invite you to accompany me for a week in Alaska in December, to photograph or simply observe this gathering of bald eagles. Our accommodation will be in Haines, a close by village.